Members enjoyed a fun “games night” at their April meeting. Competition – pretty candle – 1, Sharon Mackenzie; 2, Teela Ferguson; 3, Molly Marshall. The next meeting is on May 18 at 7pm when members will hear about Adele’s photographic trip to China. Caddonfoot Hall was the scene for children and adult dance classes when the Wednesday free taster session took place – contact Fiona on 07542 504820 or email her at fiona @bpdance .co.uk for full details. Last Thursday’s exercise class for the over-50s proved popular – and a similar event wilol be held today (Thursday). The story of Wojtek, the soldier bear, came to Caddonfoot Hall, as author Aileen Orr told almost 80 listeners of how Polish soldiers in the Second World War bartered with an Iranian boy to purchase a small brown bear for the price of a can of bully beef. Wojtek became not only a mascot for the regiment, but was a focus for the emotions of the soldiers far from home and facing an uncertain future in post-war Europe. As they headed to Italy to fight their way up through the country against German forces, Wojtek, now an adult bear, carried artillery shells up to the front lines. After the war, Wojtek and the survivors, arrived in Scotland where many of the soldiers stayed on. Eventually, Wojtek was presented to Edinburgh Zoo where he again became a centre of attraction until he died, aged 21, in 1962. Aileen brought along a model of a statue of the bear which stands in Edinburgh’s Princess Street gardens. The comedy night last Saturday was a big success, raising funds for the parent and toddlers group. Pilgrimages were the themes of the Reverend Elspeth Harley’s talks at the morning service on Sunday. She spoke of her visits to Holy Island and Iona, and the Bible readings were delivered by her and Hamish Tennant. Bible study continues on Wednesday evenings in the Trinity Church office at Galashiels. The Book of Ruth is the main feature. Alan Brydon treated members to a fascinating description of the area surrounding Midshiels, reaching back to Neolithic times with a field with burial mounds and a standing stone (like an iceberg with probably as much buried below as the 8ft showing above). Farmed for centuries, some of the archaeological remains have long since gone, but one dry summer it was possible to spot the track of the water channel from the pond above the old railway down through the fields to the mill wheel. Hawick miller John White lived at Midshiels for about 25 years in the 19th century and his eldest daughter married Andrew Haddon who later took over Honeyburn. The house itself has five staircases. A field with a one-mile perimeter was used by Harry Bell to train three Scottish Grand National winners. Sheila Marshall showed the Linus quilts she made from members’ knitted squares at Christmas. Competition – Scottish brooch – 1, Jill Fox; 2, Janice Palmer; 3, Pat Jardine; 4, Ann Joyce. Jo Hanson made a cake for the tea break. The next meeting, on May 11, is the visitors’ evening, featuring a talk on floral art. Denholm Flower Show is sponsoring a Growers’ Information Exchange Night on May 4 at 7pm in the Lesser Village Hall. This is an evening of information exchange – come along and ask questions or contribute experience in growing vegetables and fruit. Everyone is welcome and admission is free. The latest meeting was opened by hostess Mrs S. McKay, introducing Elise Ross who gave a talk and slide show on her trip to Israel. Mrs Ross and her husband lived and worked in Israel some time ago, and they wanted to see the changes. Competition – 1, Mrs W. Moffat; 2, Mrs J. Wilson; 3, Mrs R. Murray. The next meeting is on May 4 and will be the Queen’s birthday celebration. Competition – “Something With A Royal Theme”. The May 1 service at 10.15am will be conducted by the Reverend Julie Woods. The congregational board meets in the church hall lounge on May 2 at 7.30pm. Auld Earlston, the local heritage group, is holding a fundraising coffee morning on May 7 at Hanover Close, 10am-noon. Auld Earlston’s AGM is on May 3 at 7pm in the Church Hall, High Street. It was visitors’ night and Gail Chandler welcomed ladies from Morebattle, Heiton and Minto. Hamish Reid, a guide from Abbotsford, gave a photograph-illustrated talk about the life of Sir Walter Scott and recent alterations to the house. Sir Walter, at his peak, was earning the equivalent of £140,000 a year from two part-time jobs as a lawyer and a million a year from books. The competition for shortbread was won by Margaret Linton, Christine Tucker and Carol Wilson-Green. The winning coasters were brought by Gail Chandler, Hilary Lewis and Margaret Jeary. There was a raffle and sales table. This was followed by supper. At the April meeting, guest demonstrator Marjory Inglis presented imaginative, yet not difficult, ways to decorate cupcakes, interjected with great humour. The next meeting is in Kirkhope Hall on May 11 when the speaker is David Hunter, of Borders Exploration Group. 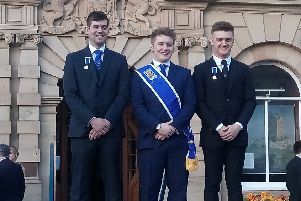 The following office bearers were elected at the annual general meeting of Galashiels Burns Club held in the Royal British Legion Club last Tuesday – president , Robert Fairburn; vice-president, Alastair Christie; secretary , Keith Cowan; assistant secretary, David Sanderson; treasurer, Douglas Watt. The club’s next annual supper will be held in the Volunteer Hall on Friday, January 27, 2017. Minister Elspeth Harley, back from holiday, took worship on Sunday, with Dorothy Howden leading music and playing a piano solo while the collection was being taken. Elspeth spoke about her holiday in Seahouses and going to Holy Island on a pilgrimage. She hopes to plan a pilgrimage to Iona in the summer of 2017 and if anyone is interested in going, they should speak to her. Ann Blackie read the lessons. The annual Masonic Divine Service was held in the church in the afternoon. There is to be an unscheduled congregational board meeting on May 1 after the morning service. Communion will be held on May 8 at 11.15am. President Mairhi Trickett welcomed four members of Edinburgh Rotary Club to last week’s meeting. Speaker Rory Bannerman was introduced by his father, Sandy, and he delivered a talk on discipline in sport and the part played by sport tribunals. He is a member of a team of 16 professional people from whom the tribunal is selected. Rugby matters come under the SRU and misdeamours such as foul play etc. are made by paper report from referees and officials, or personal hearings. The Six Nations representatives meet periodically at Twickenham to try and standardise proceedings, but different interpretations can arise from France and Italy compared to the home unions. Rory said football hearings are held at Hampden Park, giving examples of the various problems which can arise. Tribunals do not always have the benefit of video evidence to assist them. Interesting questions resulted from the talk. The service on May 1 will be at 10.30am. at the Diocesan Centre in Edinburgh on “Safe-guarding Vulnerable People”. Kelso Youth Project spring fair on April 30, starting 10.30am at The Planet (next door to the ice rink), will offer hundreds of bargains, featuring plant, book, DVD, CD and jewellery stalls. Entry by donation. Donations for the fair can be dropped off the previous day (4-6pm) and from 9.30pm onwards on the day. For further information, ring/text Ian on 07958 277766 or email ianrendallreid@cheviotyouth.co.uk. Abbey Quilters will meet on May 10 at 7pm in Abbey Row Centre to discuss exhibition items, as well as showing different ideas for small gifts or projects. Members should remember their exhibition entry form, mug and name badge. For further information,, contact Rineke Sangster on 01573 229414. April 20 – Celtic Spring Pairs – N/S – 1, Maureen Weightman & Helen Long; 2, Alex Jeffrey & Vanessa Wilson; 3, Dominic & Diana Alkin; E/W – 1, Sheena McPherson & Sheila Urquhart; 2, David Harris-Burland & Ruth Mackay; 3 (equal), Mary & Nigel Lindsay, Mary & Jim Stone. April 21 – Teams of Four – 1, Rena Stewart & Maureen Weightman, Ken Ross & Jean McLaren; 2, John Urquhart & Tricia Reynolds, David Harris-Burland & Sheila Urquhart; 3, Michael Horwood & Alison Ireland, Lynda Douglas & Vanessa Wilson; 4, Nancy Porter & Jock Dun, Keith Ackerman & Jim Stone. images illustrated her talk. This week, at the final meeting, Isabel Gordon will look back at the past season and forwards to 2016-17 – 2pm, Abbey Row Centre. Roxburgh Singers will present a concert in aid of TD1 Radio in St Andrew’s Church at 7.30pm on May 22. Soloists are Fiona Wilkie, Steve Phillips and James Letham, with orchestra and choir being conducted by Marion Dodd. Tickets (£10)available at the door – accompanied children free. Restaurateur and food writer Carina Contini will tonight (Thursday) host a charity evening with Countryside Kitchens & Interiors to celebrate the launch of its new showroom in the Corn Exchange building. David Mclean gave a presentation on “Roads & Travel in Berwickshire – 1750-1900”. He said poorly looked after tracks or paths were the only means of travelling from one Berwickshire village to another until the coming of the agricultural and industrial revolutions. Something had to be done to ensure trading could take place more easily, so the Turnpike Trust was formed. This meant that roads were made and maintained by charging a toll to users. Toll houses were built at strategic points to cover the junction of more than one road (each toll road was about 10 miles long) and barriers were put in place, with a side gate for pedestrians to use because they were not normally charged. David gave examples of prices and how some people managed to avoid paying the full amount. Claims were made by users if potholes caused damage to their cart etc. With the coming of the railways, the toll roads were no longer used as much for commercial transport and soon it was not viable to continue with this scheme. There are still toll houses in the Borders, some of which have been extended for use as family homes and David showed these on screen. raspberry jam – 1, Christine Riddell; 2, Liz Dalgliesh; 3, Sheila Hardie; wall plate – 1, Mary White; 2, Betty Wood; 3, Christine Brandeschi. Christine Riddell and helpers provided supper, Betty Russell judged the competitions, while Sheila Hardie and Annette Holton organised the raffle. The next meeting is the AGM on May 10 at 7.30pm in Lauder Primary School. Competition – photo frame; suggestions for syllabus; entertainment – Peter Pepper, magician. There is also a bring and buy stall. The rural’s summer trip to Alnwick Castle Gardens is on July 10 – names to Annette Holton (722 374) a.s.a.p. At their meeting last Thursday, Rotarians responded to the recent earthquake in Ecuador by sending £590 to Shelterbox to fund the dispatch of a Shelterbox to the stricken region. A Shelterbox provides tented accommodation for up to 12 people, together with means of cooking, water filtration, tools, mosquito nets and educational supplies for children. The service at Melrose was one of new beginnings in that there were three christenings – the children being Jacob Michael Moore, Megan Jennifer Paterson and her sister, Lauren Rose Paterson. April 28 – kirk session, 7.30pm; Trimontium lecture II, 7.30pm; food bank ongoing; May 1– united service at Melrose 11am, followed by buffet lunch at The Greenyards (notify the office if you have not done so already). How do you try to convince the archaeological establishment that Burnswark Hill in Dumfriesshire was the scene of a real siege in Roman times, and not just a Roman army firing range? Answer – by showing them the scientific evidence from the ordnance found on the ground, the sling bullets configured like acorns, or lemons, and loaded with lead or, smallest of all, grapeshot with identical holes in each one to whistle alarmingly as they tumbled through the air and descended on the enemy. Dr John Reid was in his element with his presentation last Thursday as he showed the results of last year’s excavation on the site. Members had come from as far as Largs in the west and Hitchin, Hertfordshire, in the south. This story will run and run (including to Galashiels on April 28 at the archaeological conference). Kay Callander had time to launch the fundraising call for the museum extension, the secretary to invite volunteers to come forward for museum duty (training given) and Provost William Windram, chairman for the evening, to indicate that Dr Bruhn’s talk on April 28 would be on the topic of the on-site, constantly-found glass bangles. What was their significance? Roxburgh Singers will present a concert in aid of TD1 Radio in Melrose Parish Church at 7.30pm on May 21. Soloists are Fiona Wilkie, Steve Phillips and James Letham, with orchestra and choir being conducted by Marion Dodd. Tickets (£10) available at the door – accompanied children free. Morebattle Badminton Club held its annual dinner in the Templehall Hotel on Monday night. Mary Pringle proposed a vote of thanks to the hotel staff for the meal and also thanked Marie France Taylor for organising the badminton during the year. There will be an archive open night on May 2 at 7.30pm in the institute where all can come along and receive a glass a wine while reliving memories of the past and viewing the photograph archive. The next meeting of Newtown and Eildon Seniors’ Afternoon Club will be held in the Community Wing on May 3 (2pm). President Elaine Thornton-Nicol welcomed Linda Riddell who demonstrated various flower-arranging techniques and gave members a hands-on opportunity to make their own arrangement to take home. Lorna Dickson thanked Linda for an interesting evening and donating the flowers. Competition – dressed egg – 1, Margaret Luke; 2, Mary Redburn; 3, Janette Corcoran. Seven members enjoyed the hospitality of Blainslie SWI last Wednesday evening. The next meeting will be an outing for supper on May 5. The 2016 lambing service organised by Hobkirk and Southdean and Ruberslaw congregations will take place at Falside Farm, Southdean, on May 1 at 3pm. Demonstrator at the April meeting was Gail Watson who has a florist’s shop in Kelso. She did several arrangements and kept everyone amused with her stories. Maisie Hope proposed the vote of thanks. Competitions – small jug of spring flowers – 1, Susan Gray; 2, Rose Cameron; 3, Elma Blacklock; pretty vase – 1, Pauline Looker; 2, Jean Grieve; 3, Fran Martin. Several members wished to learn how to play whist before the annual whist drive on May 27, so met on April 22 to learn. The next meeting is on May 10 when members will be able to create a piece of jewellery or book mark, tutor being Lesley Rosher from Beadelicious in Kelso. This will be held in the village hall at 7.30pm. The next service in Traquair Kirk will be on Sunday, May 8, at 10am. The next service in Walkerburn Public Hall will be on Sunday, May 15. It begins at 10am. Yetholm Sinfonia will perform on April 30 at 7.30pm in Coldstream Community Centre. Tickets from Hector Innes or at the door on the night. Wauchope Hall presents Morgan and West on April 30 at 7pm. The time-travelling magicians’ show, Parlour Tricks, is fun for all ages. Tickets from the village shop or Susan Stewart. Floral Gateway is grateful to all who attended and helped at its coffee morning last Saturday when £214.50 was realised. A festival meeting will be held on May 2 at 7.30pm in the Youth Hall. Installation Night will be held on May 6 at 7pm in Wauchope Hall. Locals are urged to attend and support this year’s principals. There will also be a presentation to Sheila Jeffrey, recently-retired postmistress. Coffee in Church restarts weekly on May 4 at 10.30am in Yetholm Church.